Some Airports Have A New Security Routine: Taking Your Temperature : Goats and Soda With ear probes, infrared cameras and laser beams pointed at your forehead, airports around the world are trying to stop infected passengers before they board a plane. 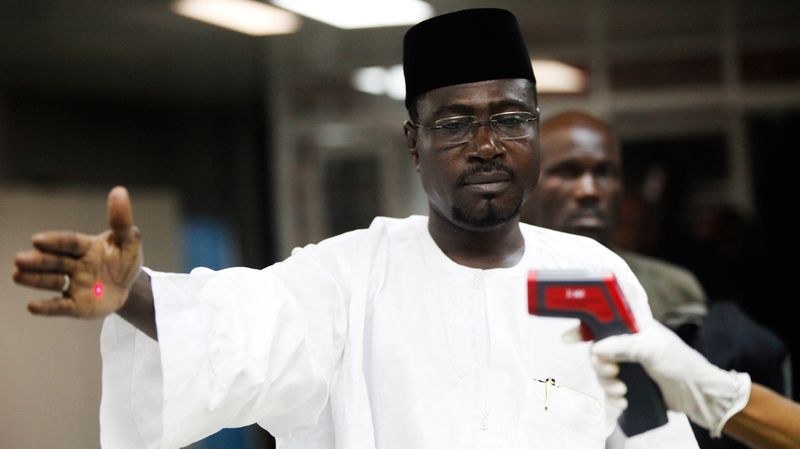 A health official uses a handheld infrared thermometer on a passenger arriving at Murtala Muhammed International Airport in Nigeria. Airport staff are measuring the temperature of anyone trying to leave the country, looking for "unexplained febrile illness," according to the Centers for Disease Control and Prevention, which is advising these countries on their exit screening processes. Critics of exit screening have pointed out the flaws in using thermometers: fever can lay dormant for two to 21 days in someone who's been infected with Ebola, and low-grade fevers can be lowered further by simple medications like Tylenol or Advil. While they can't predict symptoms before they emerge, the CDC is prepared to thwart those trying to mask a fever with a pill. "Airline and airport staff are trained to do visual checks of anyone who looks even slightly ill," says Tai Chen, a quarantine medical officer from the CDC who returned from Liberia this past Tuesday. "And most airports are using multiple temperature checks, starting when you arrive on the airport grounds in your car until you get on the plane. Even if you take medication, your fever will likely have manifested by then." Here's a look at the three methods that can be used in airport exit screening. Looks like: An electric toothbrush without the head. How it works: The pointy end, covered with a plastic cap, goes in the patient's ear while the other end is held by the airport employee six or eight inches away. After each use, the cap is discarded and replaced. What it measures: The human ear drum's temperature closely mimics the body's internal temperature. The closer the thermometer can get to the ear drum without touching the fragile membrane, the more accurate the reading. Is it accurate? The average ear gun thermometer doesn't get close enough to the membrane to give a true reading, says Marybeth Pompeii, chief clinical scientist at Exergen, a thermometer company. Instead, it averages nearby temperatures and applies "an algorithm to produce the final temperature." But Dr. Amesh Adalja, a public health expert for the Infectious Disease Society of America, says this margin of error won't matter when it comes to catching Ebola patients: "Ear thermometers are accurate within a reasonable range. If you have a fever, these thermometers will register it." Other concerns: Because the same thermometer is used on many passengers, the device could become contaminated. All those plastic caps add to the expense. And the airport staff with the thermometer is in close proximity with potentially infectious passengers. Also, the thermometers need to be calibrated correctly — which could explain how NPR correspondent Jason Beaubien registered a cool 91 degrees Fahrenheit in Sierra Leone last month. This temperature indicates extreme hypothermia, but was of little concern to the airport workers, who were looking for dangerously high temperatures, not low. Looks like: It's a camera, sometimes mounted on a tripod. A passenger probably wouldn't even notice it. How it works: Its heat-sensing abilities will turn you into a heat map on a computer screen. Bonus: The scanner can assess a group of passengers and they don't even have to stop to be screened. What it measures: External body temperature. Passengers who show up as green and yellow – the colors for normal body temperatures — are cleared for travel. Anyone with a red forehead is stopped for further screening. The full-body infrared scanner depicts body temperature with colors on a computer screen. China used the device during the 2003 outbreak of the respiratory virus SARS (pictured, above). Some airports have turned to the scanner as part of Ebola screening. Is it accurate? These machines measure skin temperature as a proxy for core body temperature, which isn't always reliable. "They measure the heat radiating off of someone," says Adalja. "That's not quite the same as internal body temperature." Pompeii thinks they are too easily fooled. "You can just go to the ladies room and splash some water on your forehead. You're going to exhibit evaporative cooling, even if you have a high fever. And you'll just sail through," says Pompeii. Meanwhile, she notes that rushing to catch a flight or having an alcoholic drink could raise your external temperature. 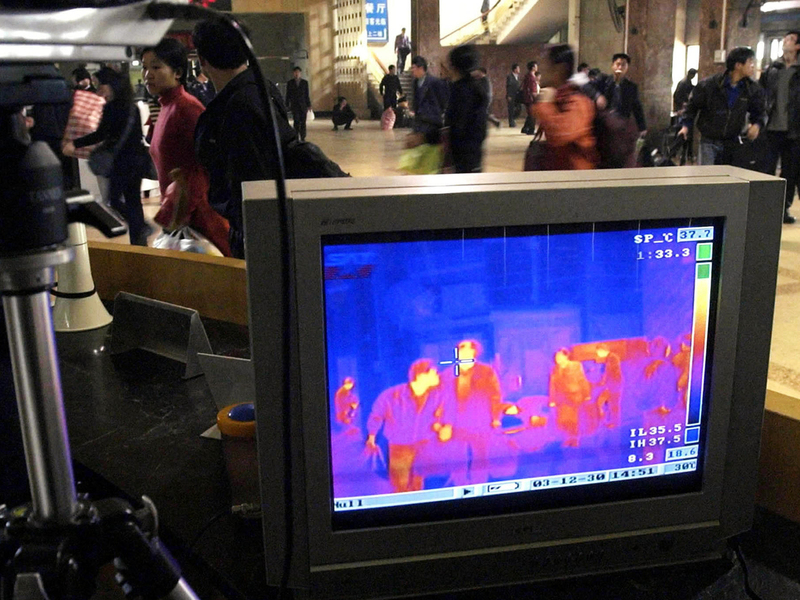 The FDA hasn't approved full-body infrared scanners for use in the U.S., but they were popular in Asia during the SARS and Avian flu epidemics. According to a 2011 study in the journal BMC Infectious Diseases, these machines correctly identify a passenger as febrile or non-febrile less than 70 percent of the time. This means healthy passengers could be stopped unnecessarily, and infected passengers could be getting on a plane. Looks like: A handheld ray gun. How it works: From a distance of about six inches, the airport employee points the laser at a passenger's hand or forehead and the infrared technology can estimate the body's internal temperature. Originally invented for industrial use to measure the temperature of extremely hot or cold items, the handheld thermometer has obvious appeal in a disease outbreak. "You don't have to touch anyone," says Francisco Alvarado-Ramy, a medical officer for the Center for Disease Control. "The risk of cross-contamination and infection is less, and you spend less time worrying about disinfecting the tool." The process is also less invasive than the ear gun and more thorough than the full-body infrared scanners. Is it accurate? "When you are holding something away from the individual, there is dust, air current, humidity, and these things can affect the temperature measurement," says Pompeii. "And your inch is different than my inch, which means everyone is measuring slightly differently." Despite these variances, the FDA approves most handheld infrared thermometers for use in medical settings. They are also the thermometer of choice for the U.S. government, which donated 30 of these infrared scanners for use in the Nigerian airport on Aug. 24. "The move in hospitals is toward these infrared thermometers," says Adalja. "They are within the range of the most accurate temperatures." Postscript: There is one way of checking temperature that is far more reliable than the rest. "The most accurate temperature is achieved with a rectal thermometer," says Pompeii. "But I don't think airlines can do that."